AS I WALKED UP THE STEPS to the house on Johns Island, I saw a pair of socks lying on the doormat. For me, I wondered? I was dressed for the occasion of seeing the nearly completed house, and I was pretty certain I-d be asked to remove my shoes to protect the brand- new floors. As I took off my shoes, Yvonne Buchan opened the door and welcomed me before apologetically explaining the socks to me. "There are some socks for you," she said. "They-re clean." No apologies needed. I was happy to pad around the house in my socks, and I was prepared to be impressed. I was not disappointed. On this visit, the house still needed a few finishing touches but was essentially complete. The remains of the old residence had been absorbed into the new addition, elevating the whole house to a new level of sophistication and style. It was transformed from a low-slung ranch house that shunned what should have been a magnificent view into a stunning and airy home that welcomes the outdoors as its focal point. If I had to choose a favorite spot, it would be the kitchen, not only for the sensible and convenient layout but also for the beautiful cabinetry throughout. Rescued from the original structure, the cabinets add a distinguishing touch of craftsmanship. But there is so much more to see: the elegant living room with its soaring beamed ceiling, the downstairs bedrooms and, best of all, the master bedroom that somehow bridges the gap between spacious and cozy. 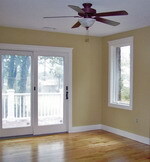 The entire second floor is dedi-cated to the homeowner-s every comfort. A large open room at one end overlooks the living room and is designed to be an office or a sitting room, perhaps even a media room. On the other side of the staircase is the entrance to the master bedroom itself, but, before you arrive there, you-ll pass a huge master bath, closet and dressing area that offers a spa-like feeling. The standout feature-one of many in the house-is the circular shower, which is both elegant and functional. Then it is down the hall-where you-ll pass an overlook into the living room-to the bedroom itself. A dramatic wall of windows invites you to enjoy the serenity of the river view from every corner of the room. 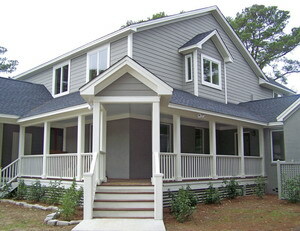 Yvonne Buchan and her subcontractors have done a wonderful job of renovating and restoring this home on the Stono River. Now it waits for the right family. When they arrive, you-ll almost be able to hear the house whisper "welcome home."